In the tropical house, you can walk through a mini jungle with amazing butterflies flying freely all around you. Many of the tropical butterflies breed here so you will be able to observe the entire life cycle of a butterfly. You will see butterflies laying eggs, caterpillars eating the foodplants, well camouflaged pupae, and occasionally watch a butterfly as it emerges from the pupae to start a new life with wings and set off on its first flight. In the exhibition area, there are butterfly collections on display showing examples of butterflies from all over the world. 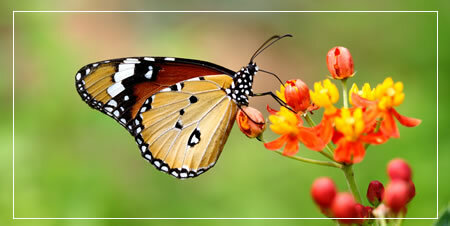 There is a special emphasis on education so be prepared to learn some amazing facts about butterflies. Also on display behind glass are a variety of live tarantulas, scorpions, stick insects, millipedes and small reptiles. 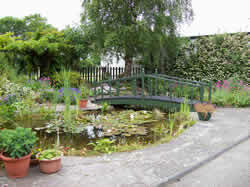 These are all housed in natural surroundings and can be viewed close up as they go about their daily lives. Enjoy a 15 minute movie about the life cycle of the butterfly in our brand new movie room. Sit and relax and learn more about butterflies. 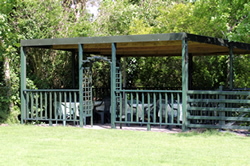 Our covered picnic area offers a sheltered area in which to enjoy your picnic in the peaceful surroundings of the Butterfly Farm. Tables and chairs are provided. Exhibition area, movie room and tropical house are all indoors so can be enjoyed in any weather. All displays are wheelchair accessible. Why do some butterflies have large eye spots on their wings? What plants will attract butterflies to your garden? Why did the Large Blue become extinct in Britain? What do butterflies feed on? Can a giant spider live for 20 years? The answers to these questions and many more can be found on display at The Straffan Butterfly Farm.